Potluck. I dread to hear the word potluck. It makes me agonize. When I am attending a potluck I always worry if someone else is bringing the same dish or if people will enjoy eating my food. Then I run into the whole problem of keeping food at the correct temperature. Well, I’m here to tell you that I think I may have a summer solution to the word potluck. What is it you ask? Pineapple brown rice salad. This dish is vegetarian, fresh, light, and healthy. Kids love it too because of the sweet pineapple. The salad is best made a day in advance to let flavors develop. You can serve it cold or at room temperature. Brown rice makes into the perfect cold rice salad because it tends to hold its shape better and offers a tender chew that can withstand pineapple’s acidity. In experimenting with cooking brown rice I have found that the best way to cook it involves boiling and then a 10-minute steam. Boiling cooks the rice until tender and the steam fluffs the rice while separating each grain. I start by preparing the rice. First, I rinse it under running water and place it in a medium pot with at least 4 cups of water. Don’t worry about having too much water because you will drain any excess. 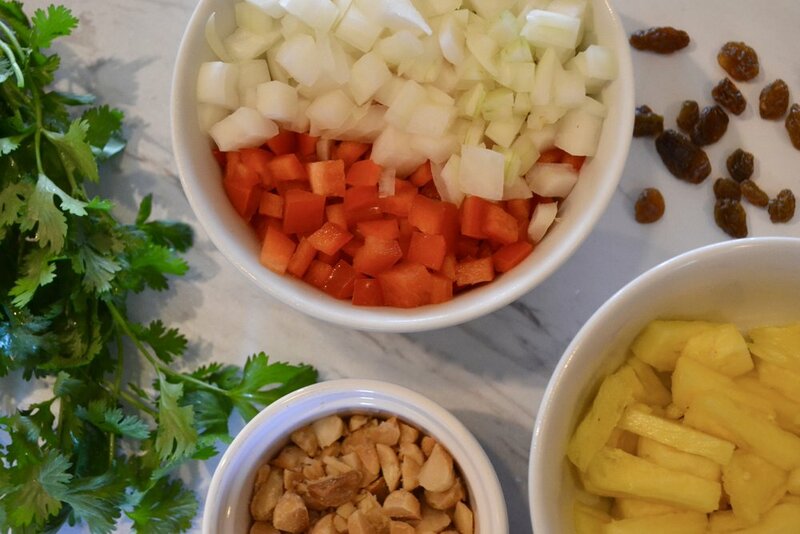 While the rice cooks I like to start preparing all of the other ingredients— chopping, measuring and roasting. After boiling the rice until tender, drain and immediately return it to the pot to steam, covered and off heat. I add all of the fun and flavorful mix-ins like pineapple, macadamia nuts, and herbs to the cooled rice. A simple dressing brings everything together. Kiss the usual soggy, mayo-drenched potato salad goodbye and make room for this Pineapple Brown Rice salad in your potluck recipe box. Fill a pot with 4 cups water. Pour in rice. Bring to a boil and cook for 25-30 minutes or until rice is tender. Drain the rice and immediately return back to a pot. Cover and allow to steam off heat for 10 minutes. Fluff with a fork. Allow rice to cool. Preheat oven to 350°F. Roast macadamia nuts on a baking sheet until they are lightly golden and fragrant, about 8 minutes. Cool slightly and chop. In a small bowl combine the lime juice, rice vinegar, garlic, soy sauce, sesame oil, and canola oil. Set aside. In a large bowl combine cooled rice, macadamia nuts, pineapple, raisins, onion, bell pepper, and cilantro. Add dressing and stir to combine. Season with salt to taste. Cover and refrigerate for at least 2 hours to allow flavors to develop.